In this article, I will go ahead and take Scientific Realism literally. We will assume that science does not merely produce machine-like theories that predict outcomes. Nope. Instead we will pretend that modern physics puts us in a front-row seat to the true nature of Reality. I find this exercise both tedious and counter-productive. I would hope that at least one reader will see why this is tedious. The past, the present, and the future all exist simultaneously. The future is as physically real as the present. This is called the "Block Universe" by writers such as Lee Smolin and Vesselin Petkov. Empty space is not empty. It is a frothing foam of virtual particles that emerge and disintegrate so quickly that they fall under Heisenberg's radar. Consequently the energy in empty space cannot be exactly zero. Photons know where they will be in the future. Photons know everywhere they could go in space in the future, consistent with physical law. Then they act like they know this. The Feynman Path Integral, weighted by action, will re-construct the Schroedinger Wave. The Schroedinger wave then informs the photon of those probabilities. Whenever an observers measures any physical system in the world, the system will "snap" into an eigenstate. The "snap into a discretized eigenstate" will hereby be dubbed the Collapse of the Wave Function. The formalism of quantum mechanics does not contain anything that is a "Collapse of the Wave Function". The Formalism does not define an "observer" either. The degree of literalness adopted determines what happens next. If you declare that because the equations do not depict it, Collapse does not occur, then the appearance of "collapse" to "observers" must be explained away. One possibility is that all portions of the entire Wave Function all still exist and persist, and that any eigenstate perceived by any observer will be a combinatorial match-up between that state and the state of the "observer's" body. Put another way, there is a copy of every observer in several other realities, with each separate reality corresponding to each eigenstate. Reality is not an objective world out there. Instead it is a collection of many worlds, all physically real, and each differing slightly in their histories. I would hope that at least some readers will perceive some elbow-room left over for other interpretations. Each of those differing from the above would constitute a retreat (in whatever small degree) from Scientific Realism. Anyone who suggests that some theories of modern physics are mathematical tools for prediction -- sitting there dis-attached from ontological commitments -- would be tacitly expressing Instrumentalism. Re: Scientific Realism taken literally. Good stuff - you had me at "photons know where they will be..." I am developing warm feelings towards Bas van Fraassen's brand of anti-realism, called constructive empiricism. Fraassen has a birthday this Friday. And now I must go clean some square roots of minus one out of the carpet in the hallway. That crap gets into everything! hyksos » April 4th, 2019, 3:56 am wrote: In this article, I will go ahead and take Scientific Realism literally. We will assume that science does not merely produce machine-like theories that predict outcomes. Nope. Instead we will pretend that modern physics puts us in a front-row seat to the true nature of Reality. What you are calling a 'true nature of reality' is actually nothing more than a model of reality. TheVat » April 3rd, 2019, 11:19 am wrote: Good stuff - you had me at "photons know where they will be..." I am developing warm feelings towards Bas van Fraassen's brand of anti-realism, called constructive empiricism. Fraassen has a birthday this Friday. I don’t know the context of the quote but it sounds like one of my pet peeves about some other science forums (not this one). Too often I have read comments that make claims such as, ‘We have gravity because Einstein’s general relativity tells us...’ This obviously can’t be right because gravity must have existed before Einstein or Newton or even humanity. Such comments are an appeal to authority rather than an explanation. Some find it sufficient to know the rule or law that “causes” some phenomenon with no apparent understanding that our laws of physics can’t be the cause of anything. I have an even greater complaint about statements such as, “photons know where they will be...” I don’t mind the “know” part and light does behave as if prescient of its destination so the “know” part is OK but photons are what Ernst Mach called a “metaphysical” since they are imagined to be real rather than based on direct observation. Mach and George Berkeley long before him complained that we have no observation to support the idea that light exists between signal and sink so any speculation about what may transpire between the two should remain recognized as speculation and not raised to the level of a reality as has happened with photons. There is a danger in this because it can lead us from the path of understanding to chase after a phantom reality that does not exist. The quote below is an example of how Feynmann fell into the trap. hyksos » April 3rd, 2019, 10:56 am wrote: Photons know everywhere they could go in space in the future, consistent with physical law. Then they act like they know this. The Feynman Path Integral, weighted by action, will re-construct the Schroedinger Wave. The Schroedinger wave then informs the photon of those probabilities. Feynman says that light wants to travel from point A to point B by the quickest way possible so he has an infinity of photons probing the space between the two at all possible speeds to reconstruct the Schroedinger wave which then informs the photon of which path is the quickest. Hugo Tetrode had a simpler explanation in 1922 where there is no need to reconstruct the Schroedinger wave because the Schroedinger wave already exists and it spans the space (and time) between point A and point B so the Schroedinger wave tells an electron (not a photon) at point A to drop to a lower energy level as it simultaneously tells an electron at point B to rise to a higher energy and the effect is light. There is no need for the photon and no need for energy to travel through space to get from A to B. It is the Schroedinger wave- not the photon- that “knows” everywhere light can go in the future because it is a wave that spans space and time in a universe of waves. Every time I see the word “photon” I think “Schroedinger wave” because it serves as a better explanation for light. TheVat » April 3rd, 2019, 11:19 am wrote: And now I must go clean some square roots of minus one out of the carpet in the hallway. That crap gets into everything! Charles “Proteus” Steinmetz described how the sqrt. of minus one is a real territory in 4D space so they even get into those 4D fibers. You have presented a narrative scenario of the emission and absorption of photons in a description of signals and sinks. For brevity, let's refer to bangstrom's "Signal-and-sink theory" as SAST. I don't have any particular problem, personally with SAST. However, modern physics definitely does. There is nothing in modern QFT that looks even remotely like SAST. Instead, what QFT says is happening is that where there were two particles, they join (absorb) and split (emit) on the vertices of Feynman diagrams. Perhaps worse for SAST, the actual integration over the path is a terrible mess of various 1-loop and 2-loop re-absorption and emission events. I'm not advocating one theory over the other, just comparing from a neutral viewpoint. I do like any idea that dispenses with some particular fundamental "element of reality". In the case of SAST, the photon becomes a mathematical tool and nothing more. "... the Schroedinger wave already exists ..."
That claim will get you in hot water in an academic context. Most professors on campus have decreed that the Schroedinger wave is the part of physics that is "just math". You will hear how the Schroedinger wave only exists on chalkboards and is a tool for calculating probabilities. Stating that it exists, flat-out carries some heavy epistemic load. If the Schroedinger wave is an extended object in space, you are approximately 1 to 5 sentences away from Many-Worlds. I don’t recognize your description of “my” signal-and-sink- theory SAST as anything I would contemplate as my own. My point is that photons don’t exist and that photon theory is total bunk and I never use the word “photon” in reference to any of my of my opinions about how light works other than to say something such as how photons are massless and charge-less because they are reality-less. A. F. Kracklauer calls photons are a “folklore” and I say we don’t need no eff in fotons. hyksos » April 3rd, 2019, 11:38 pm wrote: I don't have any particular problem, personally with SAST. However, modern physics definitely does. There is nothing in modern QFT that looks even remotely like SAST. Instead, what QFT says is happening is that where there were two particles, they join (absorb) and split (emit) on the vertices of Feynman diagrams. Perhaps worse for SAST, the actual integration over the path is a terrible mess of various 1-loop and 2-loop re-absorption and emission events. 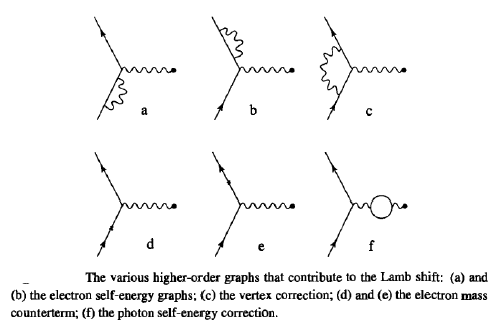 Photons diagrams have a great explanatory power whether you believe in photons or not. hyksos » April 3rd, 2019, 11:38 pm wrote: I do like any idea that dispenses with some particular fundamental "element of reality". In the case of SAST, the photon becomes a mathematical tool and nothing more. I don't know how you are defining my "photons" but I do understand photons as imaginary things we can represent with arrows and wavy lines but they have no reality except as a word to represent a single quantum of energy in a light related event. hyksos » April 3rd, 2019, 11:38 pm wrote: "... the Schroedinger wave already exists ..."
That claim will get you in hot water in an academic context. Stating that Schroedinger waves exist does not carry the same epistemic load as saying pho-tons exist. Waves have a phenomenal existence while particles have an ontic existence and that is a heavier lift. hyksos » April 3rd, 2019, 11:38 pm wrote: Most professors on campus have decreed that the Schroedinger wave is the part of physics that is "just math". You will hear how the Schroedinger wave only exists on chalkboards and is a tool for calculating probabilities. A Schroedinger wave is cyclical motion among particles and that is something we can observe so to say that the Schroedinger wave exists means that it exists as an observable motion but it does not necessarily imply that it exist in the space between. A wave is “just math” set to motion. hyksos » April 3rd, 2019, 11:38 pm wrote: Stating that it [Schroedinger wave] exists, flat-out carries some heavy epistemic load. If the Schroedinger wave is an extended object in space, you are approximately 1 to 5 sentences away from Many-Worlds. I fail to see the connection with Many-Worlds. The existence of other worlds makes it possible to remove randomness and action at a distance from quantum theory and thus from all physics. The Schroedinger wave idea includes both randomness and “spooky action at a distance” in its effects so it suggests the Block Universe but not Many Worlds. There are sections of reddit where people see sentences like this and call them "not even wrong". Sort of a jumble of science words where it is difficult to even make out a clear meaning. “Not even wrong” has become the go to pejorative for something you don’t understand and can’t explain. It was not my intention to explain the nature of the Schroedinger wave at the time so I didn’t bother to offer any detail. The Schroedinger wave is best known as a fundamental equation of physics for describing quantum mechanical behavior. The equation itself is a mathematical abstraction used to depict quantum interactions that observations tell us are a real world effect. A one line definition for the Schroedinger wave is that it is a linear, co-axial, non-local, wavelike, field perturbation. It is linear because it establishes a two-way resonant connection joining a charged particle in a sender with a charged particle in a receiver enabling the “straight line” transfer of a single quantum of light energy. Light appears to travel as if prescient of its destination because the same “open channel” that permits the Schroedinger wave to connect two remote particles also permits an exchange of light energy. The Wheeler- Feynman theory for light and John Cramer’s TIQM among others recognize the necessity for a two-way connection between a signal and receiver before an exchange of light energy is possible. The quantum eraser experiment demonstrates that a light path is only possible when an “open channel” for light is open both forward and backward in time. It is non-local because any connection between two remote points in space is also a connection between two remote points in time so the connection must be extending both forward and backwards in time. QM does not require a physical contact between two particles for one particle to affect another. Quantum entanglement is an example of a non-local connection where space and time momentarily do not appear to exist between two remote particles and they behave as if two halves of a single particle. It is wavelike because it demonstrates wavelike properties such as interference. The Schroedinger wave is one waveform in a universe of waves. The wavelike nature of the Schroedinger wave allows light energy to be transferred from a signal source to the atoms in a receiver in a wavelike pattern where the its waves interfere constructively but not where the waves interfere destructively. This gives light its observed wavelike properties. It is a field perturbation because the existence of a wave implies the existence of a medium to propagate that wave and it is this medium which is perturbed into waving. The medium is known by many names such as curved spacetime, probability waves, the fabric of space, or the luminiferous ether (aether). The universe appears to be a sea of waves in constant motion in which particles (usually electrons) can occasionally resonate together sharing a common Schroedinger wave (they are said to be entangled) and when entangled their quantum identities are superimposed like Schroedinger’s dead/alive cat. Neither entangled electron is the high energy electron or the low energy electron. They are both high/low energy until entanglement is lost. When entanglement is lost, if the formerly low energy electron is now the high energy electron and the formerly high electron is now the low energy electron, We have light! Classical EM sees massive bodies with continuous charge on their perimeters which communicate by waves in a signal-and-sink manner. Classical physics stopped making correct predictions around World War I. In the early days of QM, physicists took seriously the idea that electrons had a structure and had a "shell" surrounding them. If we include Special Relativity, then classical EM was already making wrong predictions about interferometers by 1880. Electron Barrier Tunneling is a prediction of orthodox QM. Nothing you have written in this thread even predicts that it would happen. Most of what you have written here would predict that barrier tunneling is impossible. In Bose-Einstein Condensates, it is often said that the particles "loose their individuality". They become, as it were, "one big wave" with no distinction between the particles' individuated entities. This happens to particles that have mass, which would otherwise behave like solid bullets. Relativistic formulations of QM exist and are successful. Roughly speaking, I might refer to them as QFT. QFT predicts that particles decay into various products in high energy collisions. Cramer's Transactional Theory and your homebrewed understanding of it, don't take this into account. If particles are viewed as solid bullets distinct from the Sch-Wave-Function, there is no place in such a theory to describe how they change into different forms at high energies. The wavelike nature of the Schroedinger wave allows light energy to be transferred from a signal source to the atoms in a receiver in a wavelike pattern where the its waves interfere constructively but not where the waves interfere destructively. This gives light its observed wavelike properties. Second element of massive confusion. You seem to think that the Schroedinger Wave only only applies to the phenomenon of light between electrons. But the wave function applies to everything, including protons, quarks, gluons, and massive gauge bosons that mediate the Weak Force. Most, (no) all working physicists agree that the Schroedinger Wave is the correct theory of all forms of energy and matter in the entire universe. Indeed, it is from that understanding that a concept of a ''Universal Wave Function'' emerges. Without a Universal Wave Function you cannot formulate the very premises on which the Relative State Formulation is based. And without doing that you cannot get to Many Worlds. The universe appears to be a sea of waves in constant motion in which particles (usually electrons) can occasionally resonate together sharing a common Schroedinger wave (they are said to be entangled) and when entangled their quantum identities are superimposed like Schroedinger’s dead/alive cat. What you have posted here is not taken from nor motivated by anything written in any textbook in print today. This is not Cramer's Transactional Interpretation. This stuff about "resonating together" is purely your own theory, and does not accurately capture the nature of entanglement. Neither entangled electron is the high energy electron or the low energy electron. They are both high/low energy until entanglement is lost. When entanglement is lost, if the formerly low energy electron is now the high energy electron and the formerly high electron is now the low energy electron, We have light! Entanglement can also entail a correlation between the spin states of two electrons. In that context, no energy is exchanged at all. The correlations between spin states adopt a statistics. (this is roughly a theory of low-temperature magnetism). We have seen electrons do this in superconducting cuprates, even when the conductor is cooled to absolute zero. It is not the case that physicists performing those experiments do not understand why. Quantum Mechanics predicts this behavior ahead of time. We can easily have a situation in which electrons exchange energy without them ever being in an entangled state. The act of photons being transmitted between two electrons would destroy their entanglement immediately. You have succeeded at hijacking this thread, derailing it from its core theme, and inserting your own homebrewed theories into the empty space you created. Through some magic I cannot understand, TheVat rubber-stamped you. Congratulations. Your first element of massive confusion. You think the Schroedinger Wave is a separate entity from fundamental particles. I neglected to mention that particles have individual Schroedinger wavefunctions in my explanation but that does not imply that I was unaware that they do. My intention was to explain how a long distance Schroedinger wave enables charged particles (usually electrons) to connect non-locally from signal to sink which is how light can appear to travel as if prescient of its destination. [*] Electron Barrier Tunneling is a prediction of orthodox QM. Nothing you have written in this thread even predicts that it would happen. Most of what you have written here would predict that barrier tunneling is impossible. Quantum tunneling is a well documented QM effect and useful for the operation of field effect transistors. I would seriously question any prediction that quantum tunneling is impossible. [*] In Bose-Einstein Condensates, it is often said that the particles "loose their individuality". They become, as it were, "one big wave" with no distinction between the particles' individuated entities. This happens to particles that have mass, which would otherwise behave like solid bullets. A B-E condensate acts as a wave because particles are essentially wavelike, more specifically, they are spherical standing waves in a universe of waves and they demonstrate wave like properties such as interference. I have no idea where you get this understanding. Second element of massive confusion. You seem to think that the Schroedinger Wave only only applies to the phenomenon of light between electrons. I am not aware of any differences I have between my views and Cramer’s TIQM. Where do you find we part company? My understanding is that particles sharing a common Schroedinger wave function are necessarily resonating together in a wavelike manner. Milo Wolf makes this quite clear in his book "Schroedinger’s Universe." I never questioned Wolf’s statement that entangled particles resonate together (his words) because it is only logical that two particles can only share a common wave function if they are in sync with each other. Tetrode explained long ago that two particles having a common Schroedinger wave function is a prerequisite for their ability to connect non-locally over great distances. Entanglement can also entail a correlation between the spin states of two electrons. In that context, no energy is exchanged at all. If energy is exchanged by means of entanglement, how could the exchange be distinguished from an energy exchange by classical means? The Like button is not a rubber stamp. I don't use it as a moderator, but as a member who found his speculations interesting. It seems quite relevant to the issue of scientific realism, as it examples an area where people disagree on the underlying reality. My intention was to explain how a long distance Schroedinger wave enables charged particles (usually electrons) to connect non-locally from signal to sink which is how light can appear to travel as if prescient of its destination. This is not a matter of your intention. You don't even seem to understand what I said to you. The very positions of these signals and sinks in space are themselves determined by the Wave Function. If you want to try to talk about this topic with me, you will need to do two things. Stop invading my threads in an attempt to squeeze your own theories into them and then mire me down into your own lingering thoughts about physics. 2) Try to make an even remote attempt to appreciate that fundamental particles do not act like particles, as if they were solid little bullets. Their behavior is demonstrably not like this. The Schroedinger Wave was not "tacked onto" classical bodies to give rise to the science of quantum mechanics. Actually, don't pardon me. Let me explain why he is wrong in minute detail. We have every physical-lab reason to believe that electrons disappear from one place in spacetime and re-appear somewhere else. They do not, by any physical evidence "go there" by means of a smooth path in space. Literally the electrons in the wall next to you, if they be reflecting indoor lighting, go from one orbital to another. Between one energy level to the next, the electron will spontaneously jump, and there is no observation of it "going on its way" to the next energy level. There are electron orbitals described by two high-probability regions, with a near-zero region separating them. In other parts of this forum, I described them as lobes and donuts -- and maybe posted images. The electron is never found in the middle of the two of those lobed regions. Rather, the electron "teleports" from one of those regions to the other. Quantum Barrier tunneling never finds an electron passing through the potential insulating barrier. The electron spontaneously teleports from one side to the other. This gets worse : The whole reason why molecular double-bonding happens in molecules is precisely because of the spontaneous teleporting nature of the electron. Double-bonding is not happening in spite of it, it is happening because of it. One way to visualize this, is that because electrons spontaneously teleport from one location to another, the nuclei of the atom cannot differentiate whether the electron "belongs to me" or whether it "belongs" to my bounded neighbor. The electron keeps passing in-and-out of the local orbital into the adjacent orbital of the other atom. "Pass" is the wrong word. It flips from one to the other in a random manner. This is described in the deeper chapters of any given quantum mechanics textbook. Many books will even describe how this predicts the shape of a water molecule. Perhaps you may be sitting in a room that contains solid things. like the plastic on the top of your keyboard. Maybe a desk. Perhaps a wall. Rap your knuckles on those solid surfaces. That solidity is caused by the Coulomb forces between molecules, all described classically. If you rap hard enough to break a surface, that is merely separating the molecules. The cracking and breaking is still classical physics. But the behavior of those molecules, in as much as they act like tiny solid bullets, is because of the spontaneous teleporting of electrons, not in spite of that fact. There is a type of physics that describes how these very signals and sinks break up into constituents. The physics that describes these emission, absorption , and decay events is not anything like the input particles "breaking up" like classical objects. Nothing John Cramer has ever put to paper explains the physical dynamics of these high-energy situations. You need a relativistic formulation of QM in order to describe these scenarios. Quantum Field Theory is the only known theory in the world that does this. Whether I like it or not, and whether you like it or not --- whether the moderator of this forum likes it or not -- the equations that describe QFT suggest crazy unpalatable truths about the nature of matter. What is done in QFT is abjectly alien to our common sense, and unpalatable to any philosophy about material objectivity. QFT treats "particles" as if they were these things that go everywhere in space. It "adds up all teh everywheres" and gets a sum weighted by action. Then what the actual particle physically does (your signals and sinks) is determined by this sum. What I have described here is called the Feynman Path Integral. It's crazy. It is beyond crazy. This is not just a theory of photons. This is not just a theory of electrons. Every particle known to science obeys these dynamics in high energy situations. If you are under some impression that QM is some sort afterthought tacked onto the outside of classical particles, and somehow can be explained away as "they resonate together" -- you in for a world of pain. This is not what is going on in modern physics, at all. The Feynman Path Integral is not even the worst part of this discipline of QFT. You have to become comfortable with the idea that empty space itself is not empty. Human beings don't have the machinery between our ears to intuitively grasp what this means. There are no analogies to save us. It is not "like" anything. The math works out. The predictions are deadly precise. But to sit there acting like this is simple, straightforward, or intuitive to grasp after a few diagrams on the whiteboard with an expo marker -- that is asinine. "I have no idea where you get this understanding." QFT was in the top post of this thread, bro. Maybe you are in the wrong thread.